A-list stars went all out for television’s biggest night, the 69th annual Emmy Awards. The event, hosted by Stephen Colbert, was a fun celebration of the year’s best on television. The prestigious awards ceremony also churned out some of the most glamorous looks on the red carpet. Among them were beautiful creations by renowned designer Zac Posen, sported by Halston Sage, Emmy Rossum, Viola Davis, and Sarah Hyland. These fabulous ladies wore stunning dresses that encapsulated the masterful craftsmanship of the designer. Halston exuded understated elegance in a gorgeous white gown from Zac Posen’s Resort 2018 collection. It featured a cold-shoulder detail, an open back, intricate embroidery and a floor-length skirt. The draping and hand-pleated details are remarkable, and they truly showcase the designer’s artistry. A sleek updo and minimal makeup ensured that the focus would be on Halston’s stunning gown. Subtle touches like a white marble clutch and dainty diamond jewels from Chopard finished off this perfect red carpet look. Halston Sage at the 69th annual Emmy Awards held at the Microsoft Theater in Los Angeles, California, on September 17, 2017. Designer Zac Posen with Halston Sage at the 69th annual Emmy Awards held at the Microsoft Theater in Los Angeles, California, on September 17, 2017. Emmy brought a dose of drama in a shimmering black gown at the star-studded awards ceremony. This Fall 2017 number featured a strapless neckline, a floor-length skirt, and intricate embroidery, which the actress complemented with side-swept waves, smoky eyes and soft pink lips. The genius addition of emeralds kept this Zac Posen design from being just another black gown on the red carpet. They looked utterly divine on Emmy and they added a pop of color against the beautiful black fabric. We’ve always expected classy red carpet offerings from Emmy, but this one was just absolutely stunning. Emmy Rossum at the 69th annual Emmy Awards held at the Microsoft Theater in Los Angeles, California, on September 17, 2017. Sam Esmail and Emmy Rossum at the 69th annual Emmy Awards held at the Microsoft Theater in Los Angeles, California, on September 17, 2017. All eyes were on the award-winning actress, who stepped out in a head-turning tangerine gown that suited her perfectly. This custom satin crepe number featured a sleeveless design, a floor-length skirt, and a long train. Viola styled it with dark red lips, a gold Tyler Ellis clutch, Stuart Weitzman heels and Harry Winston jewelry. 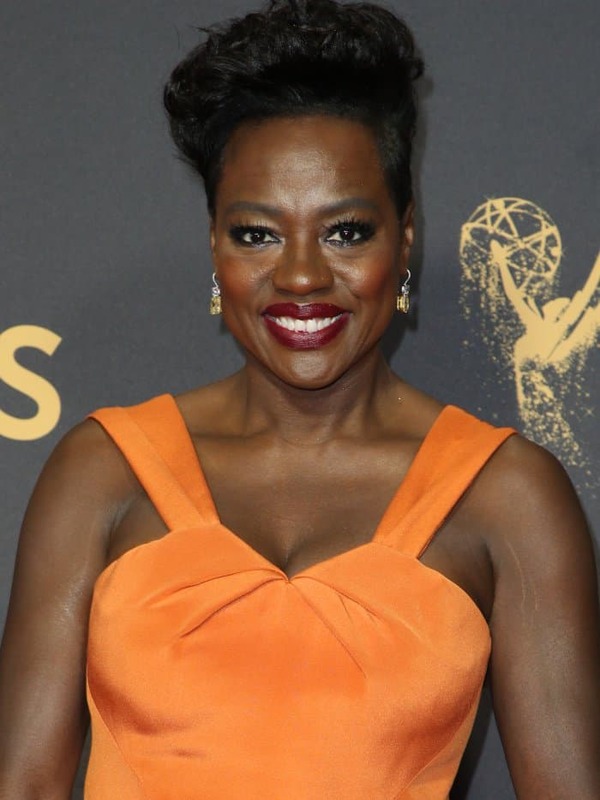 Viola Davis at the 69th annual Emmy Awards held at the Microsoft Theater in Los Angeles, California, on September 17, 2017. Julius Tennon and Viola Davis at the 69th annual Emmy Awards held at the Microsoft Theater in Los Angeles, California, on September 17, 2017. Finally, Sarah was all about sultry elegance in her red Resort 2018 gown from Zac Posen, which featured beautiful leaf embroidery, a cut-out waist, a floor-length skirt and a short train detail. She styled it with side-swept waves and jewelry from Lorraine Schwartz. The “Modern Family” actress seem to enjoy experimenting with vampy looks recently to accompany her darker hair. We saw a preview of this at Variety and Women in Film’s 2017 Pre-Emmy Awards party. Sarah Hyland at the 69th annual Emmy Awards held at the Microsoft Theater in Los Angeles, California, on September 17, 2017. What do you think of these Zac Posen gowns on the 69th annual Emmy Awards red carpet? Whose look was your favorite?